A toilet roll holder is a stylish bathroom accessory which keeps the room tidy by supplying your loo roll with a place to live. 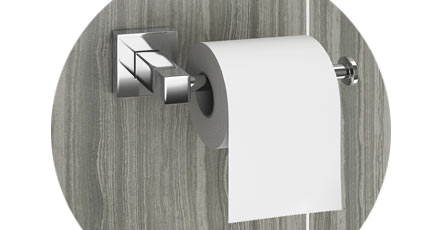 Our huge range of freestanding toilet roll holders + chrome toilet paper holders includes various shapes, colours and materials ranging from chrome, antique gold and various wooden finishes. Toilet roll holders may sound like mundane items, but they are in-fact a great way to continue your theme. Many of our holders are designed to complement other fixtures in the bathroom such as taps and towel rails. The smaller details can so often make a huge difference to the look of a bathroom and it's no different with these essentials. Choose a toilet roll holder which matches your decor and you'll be surprised at the positive impact it can have!